A Picture Poll - Ramblings of Mad Shutterbug & the Border Collie Bros.
Cow & Hog... more or less Safe for Work, covering most definitions of Work. I've posted this one before, which is why it isn't exactly the Pic'o'Day. Here are the questions/reason why I'm posting it again. I must say I would not have pegged that as a hog skull. I tend to think of them as shorter and broader. That looks more like goat to me but I am a poor city girl who thinks meat comes in little blocks at the store. Oh, it's a hog skull all right. The hogs we've got come from a batch which resulted in cross-breeding between domestic: Durock (Wikipedia link) and Poland-China Spot and Baja Jorja Wild. They've got much longer snouts than domestic hogs do as a consequence. They're also noticeably less docile than domestic hogs. More significantly, they make a bigger ham than wild so things are fairly balanced there, and they are leaner than domestic. And (if we do say so ourselves) very tasty. It's gorgeous, but it's very green. i think the skulls themselves are interesting but the background isn't conducive for that "goth" feel of a samhain / halloween thing. i take it the cow was shot. Yes. Jumped the fence one too many times. Into the freezer with 'im! If I had those skulls, I'd go for a more geometric relationship between them. 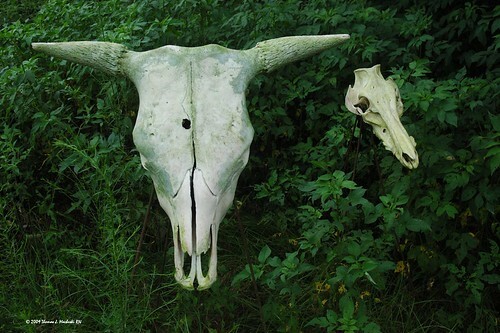 I can see both of the skulls face on, like the cow is, lining the noses up horizontally, and lining the right edge of the pigskull up with the tip of the right cow horn. Or stick them both on sticks, enlist the help of your favourite models and see what ideas present themselves. yeah I agree that skulls themslves are very Hallowwen/ samhain, but not specifically the way they are represented in this picture. I don't picture it doing great because it reminds me more of summer and nature or farms in general due to all the green and nothing really ooky spooky or spiritual or dark about this one. I do think you could work some skulls to do well at the con, but this one doesn't particularly strike me as something I'd buy a print of during that time of year.